The JA Series is designed to meet all your entry security needs. Hands-free communication, expanded capacity, seamless integration to CCTV systems, motion detector activation and built in selective door release are just a few of the standard features of this remarkable two-wire system. Adding an optional digital recorder style master ensures that all facets of a CCTV system can be covered in one convenient package. 2 PanTilt video door stations and 2 Motion-sensor cameras allow you to visually communicate with visitors and spot suspicious people from 3 rooms, and the camera images can be recorded. PanTilt enables control over a wide field of vision. The image of the PanTilt video door station can be adjusted to a more visible position from inside the building, using control located below the four inch color monitor. The motion sensor camera detects intruders, alerts the inside through a video image and alarm. 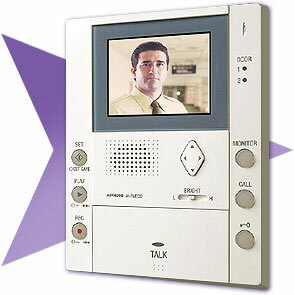 When an intruder is detected, the inside of the building is alerted through a video image and alarm. 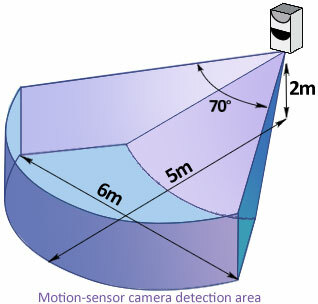 The motion-sensor camera activates 1 minute after the SET button is pressed. Be sure to get an image even if the visitor moves. Enlarge and play the shot with the most recognizable face. Up to 8 of the recorded scenes can be saved on the station. Manual recording is possible even while talking with the door station. if you think there is something suspicious outside, press the MONITOR button on any inside unit to see and hear what's going on. Press the REC button to manually activate the image recording. Ail-Call to all room stations simultaneously from any of the connected room stations. Reply to an all call by simply pressing the ''TALK" button. Door calls may be transferred to any station in the system. Color video is operational during low light conditions when white illuminator LEDs built into the video door station automatically activate. Two door release contacts for selective control. An optional foot switch or any other dry closure contact device can operate the "TALK" switch. When it is difficult to press the TALK button on the monitor for whatever reason, you can communicate by stepping on a foot switch. Any normally open switch can be used to activate the TALK button. Current Consumption JA-2MECD: max.750mA. JA-2MCD: 680mA. JA-2HCD: 290mA. JA-2SD: 120mA. Calling Chime. Image & voice,approx.30sec. Communication AUTO; Press TALK momentarily, then talk/listen is auto voice-actuated. MANUAL; Press TALK 1sec. or more. Then, press to talk, release to listen.